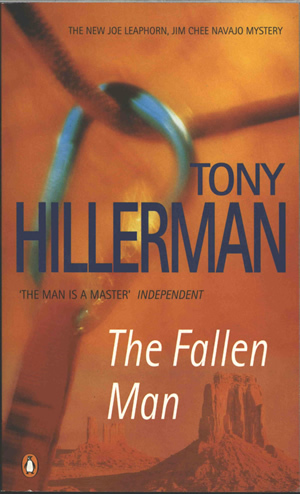 This is the paperback British edition of The Fallen Man, published by the Penguin Group, London, in 1997. The cover photograph is a composite by Tony Stone Images and shows a carabiner around a climbing rope above a landscape of red sandstone formations in the lower right. The author's name is printed in blue in large type, with the book title in white below. On the back cover, the image of the carabiner and rope is repeated, opacified, beneath text printed in white summarizing the novel plot. The bar code and publisher information are printed at the bottom of the back cover. Binding: Full-color paper covers. On the spine, the author's name and book title are printed above the penguin logo.